Ten years after the Holy War in Hong Kong, Mochizuki Jirou, aka the Silver Blade, and the lone hero who fought and defeated the Kowloon Children despite the loss of his lover, returns to Japan with his young brother, Mochizuki Kotaro. The two quickly discover that the Kowloon Children who survived the Holy War are seeking to infiltrate the "Special Zone" - a thriving city protected by an invisible barrier that will not allow Kowloon Children entranceunless they're invited. Red Bloods refer to the humans; Black Bloods are the vampires, and the Mochizuki Brothers are Old Bloodthe last descendants of an elite clan of vampires. When Kotaro is abducted by one of the Kowloon Children, Jirou has no choice but to fight once more. Watch Black Blood Brothers Episodes Online at Animegg.org. 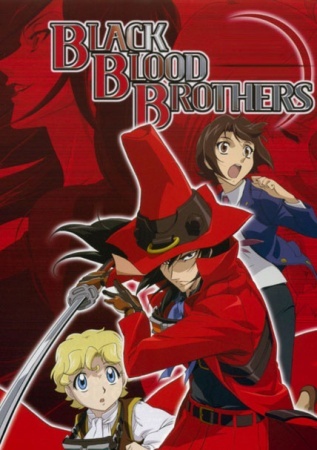 Black Blood Brothers is available in High Definition only through Animegg.org. Choose an episode below and start watching Black Blood Brothers in Subbed & Dubbed HD now.